My newest book, A Warmer World, details how climate change, or global warming, is affecting wildlife today. Our planet has gone through many periods of warming and cooling. In the Dinosaur Age, the Earth was MUCH warmer than it is today--so warm that there was no permanent ice at the poles. It was global warming big time! In my book Global Warming and the Dinosaurs you will learn about dinosaurs that thrived in Earth's polar regions. New discoveries in Alaska, Antarctica, Australia, and elsewhere are revealing how these ancient reptiles not only survived at Earth's extremes but were well adapted to live there. Evidence from bones and teeth to trackways and skin impressions raise important questions. How did polar dinosaurs cope with three months of total darkness in winter? What did they eat? How cold was it? Today, as we face the consequences of global warming, dinosaur fossils are helping us to understand what a warmer Earth was like long ago. 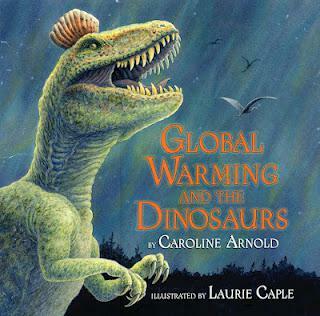 You can see a preview of Global Warming and the Dinosaurs in this book trailer on YouTube.